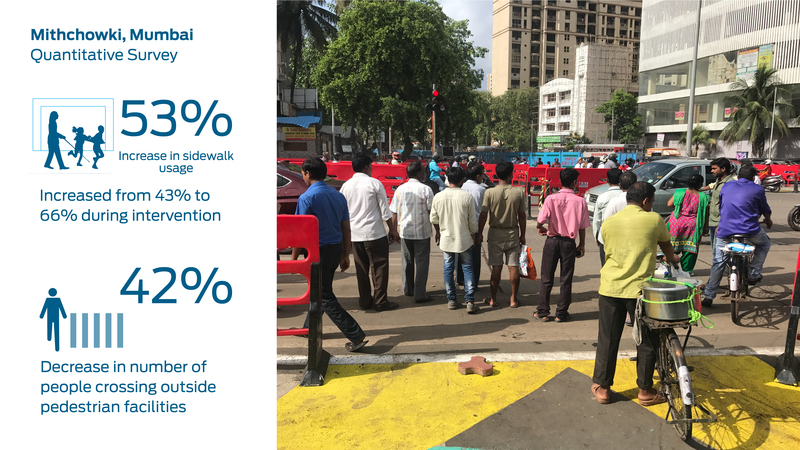 As we approach the 2018 Road Safety Week in Mumbai, India, we decided to revisit NACTO-GDCI’s collaboration with MCGM and MTP from last year, where a week-long trial and Mithchowki in Malad, was conducted to reclaim ~1650 sq.m of underutilized roadbed on the street for pedestrians and support a space that is more legible for all users. Through narrowing free turning lanes and tightening corner radii to reduce speeding vehicles, and widening pedestrian sidewalks, approximately 27% of the intersection area was redistributed to support safer movements for all road users. Striking strokes of bright blue, green, and yellow fill in these curb-extensions alongside the wider and direct crosswalks and new refuge areas. These evidence-based strategies are proven to reduce the risk of exposure of pedestrians to moving vehicles by giving them safer spaces to wait and shorter distances to cross. The demonstration served as a critical tool to trial and evaluate design strategies that helped address the intersection’s increasing road safety risks due to growing vehicular volumes and pedestrian movements due to the incoming metro. 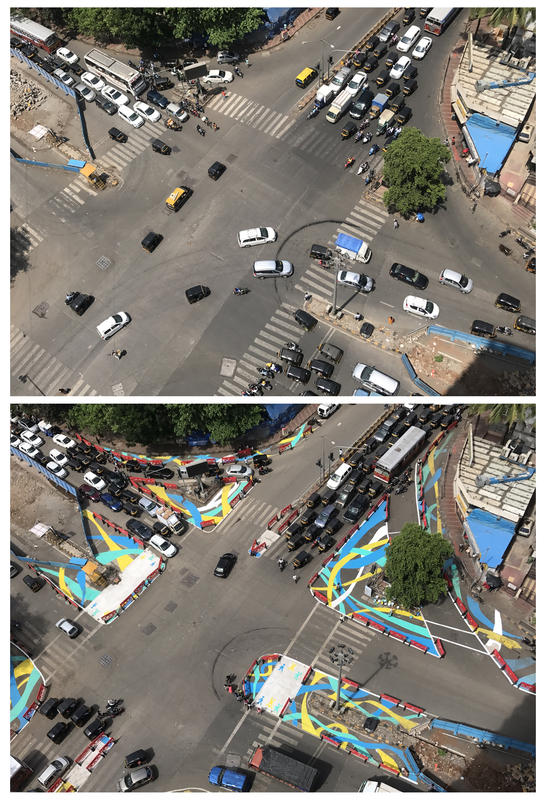 The temporary artwork was completed in collaboration with KRVIA, and conceptually represents the direction, path, and volumes of pedestrians moving on the roadbed before the intervention. The interim intervention was planned to refine longer-term design strategies for the local context and to inform future design and construction of street projects around Mumbai. The proposal is based on principles from the recently released Global Street Design Guide, which aims to distribute the road space more equitably amongst different groups of people using the street and to prioritize our most vulnerable road users; the pedestrians, children, elderly, and those with disabilities. Simple, yet effective strategies around lane alignment, effective pedestrian crosswalks, and reclaiming under-utilized road space for new public areas, have been used to channelize the movement of vehicles in an efficient and logical manner and provide the pedestrians with a safe and comfortable environment. Brief data collection exercises before and after the transformation helped evaluate the project and were collected in collaboration with students from KRVIA – Kamla Raheja Vidyanidhi Institute for Architecture. User surveys on all data collection days further provided an insight from the local people to understand their perspective of how safe or vulnerable they feel while using the space, and how they would see it change. 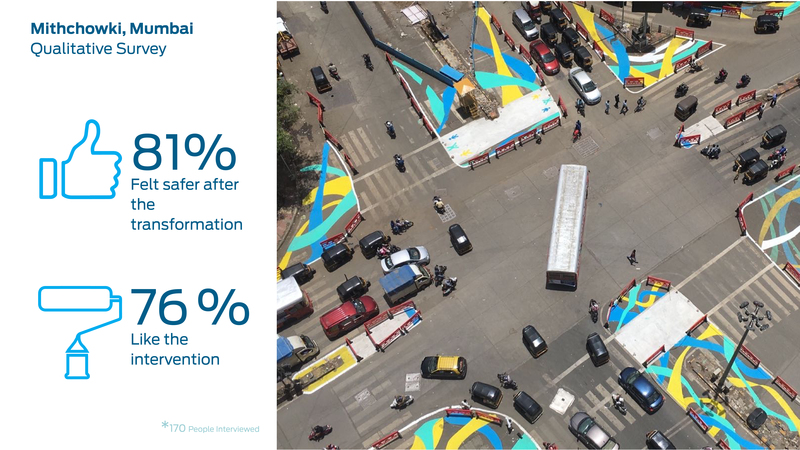 81% of the pedestrians felt safer at the transformed intersection while 76% of the people preferred the transformation. Due to lane alignment allowing for efficient movement of traffic, the volumes of cars and two-wheelers passing through the intersection during peak hours increased. This reveals that reclaiming underutilized roadbed and delineating space for motorists, not made the intersection made safer, but also more efficient. The safety benefits can be seen through indicators such as sidewalk and crosswalk compliace by pedestrians. There was seen to be a 53% increase in pedestrians using the sidewalks beacuse of the curb-extensions, which were used by 43% of the people earlier and grew to 66%. Even the people crossing outside the crosswalks, decreased by 42%.